I'm fortunate that in my travels, I have the opportunity to try so many excellent wines from Italy and other countries. Many of these wines are limited and priced above $50, so believe me, I appreciate the chance to sample these wines. But I'm always excited to try wines that combine excellence with an honest price. I'm even more excited when these wines are from a region where values are not commonplace. Evidence of that are two new bottlings from Giacosa Fratelli, a small producer in Neive in the province of Cuneo in Piemonte. Giacosa is known most of all for their bottlings of Barbaresco, as the town of Neive is one of three where this Nebbiolo-based wine can be produced. I tasted two bottlings of theirs from the newly released 2007 vintage: the "Basarin" and the "Basarin Vigna Gianmate", both of which I have rated as excellent (4 out of 5 stars). Each offers impressive depth of fruit, lovely aromatics and gentle, silky tannins (especially the Gianmate bottling). These are among the finest bottlings of Barbaresco from the notable 2007 vintage; both should be at their best in 10-12 years. Like most producers, Giacosa Fratelli also produces other local wines and these are the ones I'd like to focus on in this post. The 2009 Roero Arneis is a lovely dry white made from grapes grown in the Roero zone, across the Tanaro River from the Barbaresco zone. This is medium-full with typical pine and pear aromas with a nicely balanced finish with very good acidity. This is a tasty, refreshing dry white that is ideal with risotto with vegetables or lighter seafood. 2009 was a brilliant vintage in Piemonte, so there's a bit more depth of fruit than in other years, meaning this wine could hold for another two years (though it's so appealing now, so why wait?). Best of all, it's priced at $17 retail; as Arneis has become quite a sensation in America over the past few years, this is quite a value. The winery's 2007 Barbera d'Alba from the Bussia vineyard in Monforte d'Alba is another wonderful success. Rich with the spice so typical of the Barbera grape, this has a nice zesty, tangy quality to it that makes it perfect for grilled chicken, ribs or pork or pastas such as tajarin with beef and tomatoes. Barbera has very light tannins for a red wine, so that makes this wine quite drinkable now, even though 2007 was a year that resulted in deeply concentrated red wines in this area. Stylistically, I love this bottling as the winemaker decided to age this wine in large oak casks instead of barriques, thus keeping the focus on the tantalizing black cherry and blackberry fruit. It's a real pleasure to taste this wine, especially when you consider that you are getting a Barbera from a single vineyard from an excellent vintage and you only have to shell out $17 for the wine - a remarkable value! For me, there is no other region in Italy that produces as many outstanding wines as does Piemonte, but let's face it, you usually have to pay for that quality. So how nice that these two wines, from a very consistent, quality driven producer such as Giacosa Fratelli are so good and so affordable! Here's hoping that more producers from this area follow suit! Sometimes (actually most times) the lower-tier wines are the best, even though they're not the ones the winemakers consider the most "important." I'll have to check out that Barbera. You're absolutely right about the lower tier wines. Usually they are better than the higher priced offerings. I'm not sure how available that Barbera is, but I hope you can find it - it is "honest" Barbera. The quality of wines at the entry level, usually €4-6 from the cantinas is consistently good and better than most other Old World regions e.g. Toscana. I don't agree that they are "usually" better than the higher priced offerings but I guess many fantastic wines never make it out of Italy/Europe due to modest production. I'd comment that most of the higher priced offerings do make it here to the US from Italy and other parts of Europe. There are thousands of small importers here and they get everything they can. What Jeremy and I are commenting on is style - a lot of these expensive offerings are manipulated to be so ripe and so oaky, which is not what I like, although some people do. I prefer the simplicity and honesty of the basic wines. That said, I love great Barolos, Barbarescos and Brunellos that are priced at $50-$150 a bottle here. It's all about what's in the bottle, not the price. 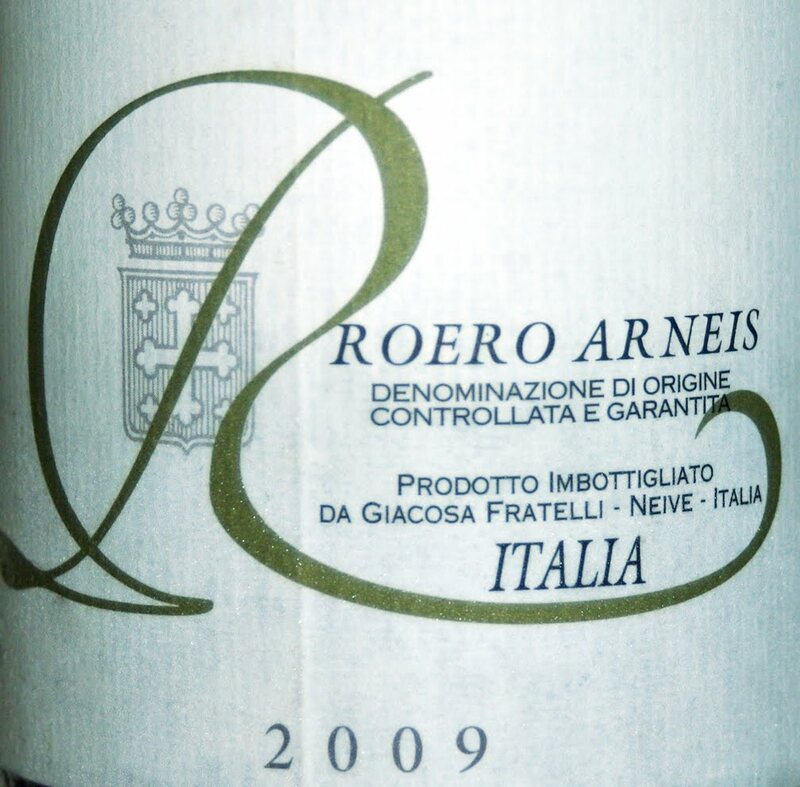 Not to be confused with Bruno Giacosa Arneis, the best Arneis producer IMO. Had their 2008 twice recently - one of my favorite Italian whites this year. Yes, a different producer. Bruno Giacosa does make an excellent Arneis along with Vietti as well as Malvira and Matteo Corregia, two producers located in the Roero. I wanted to focus on a lesser-known producer that makde an excellent bottling that was a value. Tom: I agree, I was talking about the lower priced wines. The big priced wines are well marketed and thus always make it out. I live here (www.piemontemio.com) and plenty of the producers I visit and taste every week are family run and usually too small to export meaningfully. If more people were introduced to the wines of Piemonte (instead of the more famous wines of Tuscany), they'd find some nice values. Thanks for noting these wines!